I’ve been told a few times that the secret to running is to train hard and race easy. Training is a pretty easy thing to think about – you pick a goal, find a plan, print off the schedule to stare at you everyday and guilt you into getting out of bed earlier or staying at the gym longer and the rest is easy. In 2016 I trained harder than I ever had for anything in preparation for the London Marathon. Everything aligned perfectly leading up to and on the day itself – the training had gone well, all the aches and pains had gone away, I slept well the night before and race-day conditions were perfect. At mile 18 my knee collapsed and I was carried off the course. Thirty minutes later, despite the advice of the people who carried me, I dragged myself and my leg back on the course to finish. I finished but I was gutted – fifty minutes off my target. I didn’t run for almost a year. The combination of my knee and finding excuses with work and a young baby meant I was in very little danger of being dragged back into the temptation of trying something like that again. I even joined a local running club to prove that I hadn’t entirely given up and still had the intention of doing it again one day but just not this week because I had to finish that thing for that person…. Watching the 2017 London Marathon from home I found myself in tears of almost every sort and entered the ballot just to see what might happen. Unsurprisingly, nothing. In December though, I threw my name into the Sandhurst Joggers hat and that decided it had other plans for me and call me out on my excuses. I trained through the winter getting fitter and stronger as my wife grew more pregnant. The marathon was on the 22nd and the baby wasn’t due for another week so that wouldn’t be a problem. Four weeks before the marathon it was suggested that maybe I shouldn’t disappear for three and a half hours on long runs just in case I was needed suddenly. I was limited to short runs outside or long runs on the treadmill and I’ve now covered almost 90 miles running while looking at the same wall. After all that though, I got my final twenty-miler in and was ready for a week or so of tapering. On the 17th my wife and I welcomed our second baby to the world, 12 days earlier than planned, and it took me two days to realise that sleeping 2 hours a night and not being able to see straight was maybe not the best preparation for a marathon. In all honesty the five days between baby arriving and stepping onto the coach on Sunday morning are all a bit of a blur but on the coach it seemed that everyone had heard of my recent adventures and I got looks of surprise and concern that I was there at all! Standing in the blue start area I began to get worried again, it was only 09:00 and I had broken a sweat getting changed! I sat with Connor and Paul for a while having some breakfast and talking about tactics. At around 09:30 we went our separate ways to our start pens. I knew I had to be careful, my body was not where I needed it to be and the temperature was already climbing. I took the first 3 miles as a bit of a warm up, needing to make a toilet stop but generally trying to settle the nerves and find a rhythm. At mile 3 I tried to pick up the pace slightly to make sure I hit mile 6 in around 55 minutes and then would try to maintain that pace. At mile 8 I needed to change tactics drastically. It seemed like there were people collapsing all over the place and I was already starting to feel the effects of the heat, the lack of sleep and exhaustion of the previous week. 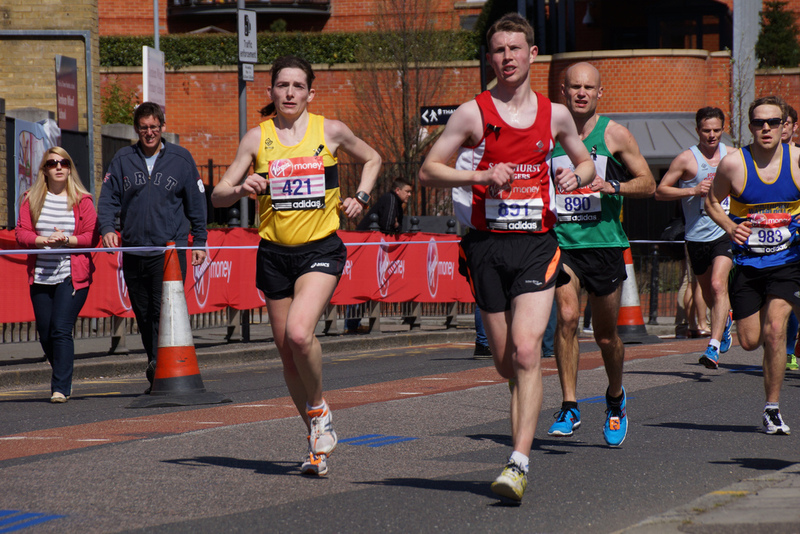 I made a conscious decision to slow right down and try to enjoy the London Marathon for one of its most renowned aspects – the atmosphere and crowds. I also knew that to try and push on at my target would likely end up in me falling by the wayside like so many others were doing. The section around the Isle of Dogs was horrendous, I saw temperature gauges on buildings saying it was almost 28 degrees and the sun was relentless. Once I hit mile 15 I was a wreck, even at the slower pace, and I realised the only way I was going to get through the second half was to run for 10 minutes and walk for one (or two). Psychologically, I needed to get past mile 18 where my knee went last time and from then I just needed to finish. Once through Canary Wharf I felt more comfortable again, I had come to terms with the fact I wasn’t going to be anywhere near my target time so just spent the next couple of miles sharing the experience with other runners. So many were hobbling or stumbling and I tried to spend a few seconds chatting to them to try and help take their minds off things. By mile 23 I was cruising slowly, the crowds were getting bigger and louder and I just tried to take it all in. Apart from another toilet stop, I carried on through to the finish trying to take in all the sights and sounds that London is famous for. I have not stopped smiling since Sunday despite the weather conditions being far from ideal, the exhaustion thanks to the early arrival of my second child, and being over an hour away from my target time. London Marathon is an incredible event and I cannot thank the club enough for the opportunity to experience it again. Training starts again this week but so does getting to grips with a newborn and a 20-month old.